Privately held power gym for internationally competing powerlifters and strong man competitors. VALHALLA power gym – strength through power, lifting the chosen to the top of their game. Strongman competitions are popular in Scandinavia but during winter there are few good places to work out. Many people train in garages or industrial halls or travel hundreds of kilometers to reach a suitable gym with the equipment they need. Building the Valhalla power gym answered a need for a gym with modern equipment for both powerlifting and special strongman competition workouts. Maintenance costs have been kept as low as possible with lighting automation, geothermal heating, big windows and of course – LED lighting. LEDiL’s technical support made simulations and design suggestions for the lighting. One product that had to be included was STELLA-HB, as it was a product the owner loves. It was also the perfect solution for bathrooms because of its excellent water and dust resistance. The changing rooms are illuminated by indirect lighting using LAURA-SS-WAS, and the main gym area with FLORENCE-3R linear optics. STRADA-2X2-FT was chosen for the exterior of the building. Big windows provide large amounts of natural light and brightness and movement sensors were installed to help save energy and switch lights off when not needed. The ability to control the lights manually was also important, as it is helpful to be able to switch off overhead lighting when doing bench presses for example. The end result was an approximate 90% energy saving compared to a typical installation using fluorescent tubes. Despite all the technology and lighting components used, only one repair has been needed since the project was completed. Due to vibrations caused by the continuous slamming of the changing room door one STELLA-HB came loose from its heat sink almost starting a fire. Since it was repaired there haven’t been any other problems in the past two years. 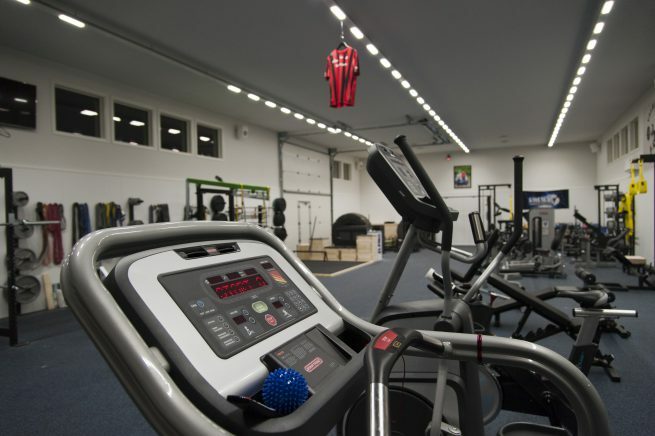 Thanks to cutting edge technology together with comprehensive workout equipment and facilities Valhalla is considered one of the best power sport gyms in the country.